An EBF Maiden Stakes Over 5f on good to firm ground. A large field with half a dozen juveniles with form and mixed bag of debutantes. Top Boy is a talented two-year-old. This good-looking colt by Exceed And Excel has an official rating of 100 after running at Group level. His best performance being a narrow loss in the Weatherby Super Sprint on testing ground. Most recently, he ran in the Richmond Stakes (Group 2) over 6f. By all accounts Derek Shaw's bay colt has more than enough ability to win a race of this nature and this drop back to the minimum trip is probably more suiting. The downside is that after six races there is a concern he could be regressing. That will be the gamble for those who are tempted to bet on his proven class edge today. A strong challenger if still enjoying his racing. 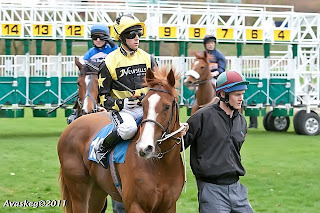 Of the other form horses, Polish Crown ran well on debut at this course over 6f. One of two fillies in the field today, she ran with promise on debut although showed signs of inexperience before running on with purpose in the closing stages. On that performance, you would have to question whether this drop back to 5f is ideal. Those fears may be more to do with inexperience than pace so that point must be considered. Breeding suggests a greater test of stamina will be needed in time. Alan Swinbank trained the winner that day and in ways the form of those behind still leaves a few question marks. There will be improvement to come but uncertainty regarding this trip. The Johnston stable often make the running so from an early stage you backers will probably know your fate. Shillito is a fair juvenile for Tony Coyle's stable. He has run creditably on his last three starts. This breeze-up purchase was a canny buy at £15,000 and connections will fancy their chances of stealing a win before the end of the season. This bay colt ran well over course and distance but was fairly put in his place by Ziggy's Secret. Again, a determined attitude was displayed when just held at Thirsk in a race that many thought he would win. This son of Kyllachy is likely to show his form race but he reminds me of the type to be vulnerable. More of a place candidate that a strong win chance in my opinion. On their recent Thirsk effort, Milkwood is held. Time And Place was just ahead of Milkwood and could improve a good deal for that first start. Richard Fahey's son of Compton Place was a fairly expensive yearling buy at £48,000. He was well backed that day but a slow start all but finished his hopes and it was an honest effort to finish as close as he did. More should be expected and it wouldn't be a surprise to see him get pretty close to Shillito. Of the debutantes, Bitusa hails from Alan Swinbank's stable, who have a line to the likes of Polish Crown. This American-bred gelding comes from a sprinting family. The stable can be difficult to assess with their debutantes although they can have them primed for a big run. The betting is the best guide. If backed to 13/2 & less I would expect a bold show but conversely if weak in the market, best watched. The betting will tell the story for another interesting debutante, Spirit Of Parkes. This grey gelding has mixed breeding, from a sire who appreciated a trip but the mare was a real talent for Jack Berry. Lucky Parks was a good, strong & talented filly who won substantial prize money over her career as a sprinter, competing at Group class on occasions, winning seventeen races in all. If priced 7/1 & less I would expect a handy display. Robot Boy is worth noting. Qatar Racing Ltd never fear the cost of a horse and this son of Shamardal was a recent breeze-up purchase at 115,000gns. David Barron has some exciting two-year-olds this season and a number of debut winners. The key to their best is dictated by their starting price. Connections clearly know when a horse is expected to go well and the money is put down with little uncertainty. If backed, take note. If priced 13/2 & less you should expect a big run although a wide draw does temper enthusiasm. Conclusion: An intriguing race. Top Boy - at best - would take the world of beating and deserves to win a race our two after a number of sterling efforts. The gamble is whether this youngster is enjoying his racing. A few hard races can sour a horse and with six runs under his belt there is a worry he could regress at some stage. There is often no clue to when this may happen and that is why is pays to be careful with such horses. I would give him the benefit of the doubt and hope he runs a big race. At best a winner waiting to happen but I wouldn't bet at short odds. Polish Crown is difficult to assess. She was very inexperienced on debut which probably makes this drop back to 5f look worse than it is. However, I would have slight concerns this will happen all to quick. Shillito is the most guaranteed to run his race but may need a few of the principles to under perform to win. Time And Place may have a chance of reversing the form with Shillito on their recent Thirsk effort when struggling from a slow start. If strongly fancied in the betting it would bring further confidence. The betting will be the best guide to the debutantes - a few who are worthy of note. Bitusa, Spirit Of Parke & Robot Boy would all have fair win and place claims if priced 13/2 & less. Of most interest is the latter, trained by David Barron. This juvenile hails from a notable owner and a trainer who knows when their juveniles have a winning chance. Money talks with this stable and if substantially backed I would take note. Top Boy will take all the beating if at his best but if the debutantes are strongly fancied it might just pay to fear them as worthy opposition.